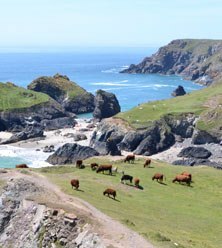 Cornwall is a fantastic county with friendly people, beautiful countryside, great food, a vibrant history and a strong sense of Celtic culture. During our walks we discover tiny fishing villages, smuggler's coves, dramatic cliffs, countless spectacular beaches and sweeping bays. The Dartmoor in Devon is a truly inspiring part of the world! It has swards of pasture, narrow lanes and picturesque thatched cottages. The heart of the Moor is wild, heather-covered hills, punctuated by the stark beauty of the granite Tors. Normandy, the land of Calvados, Camembert and cider, just can't help looking like it is posing for a picture postcard. Rolling hills so green they make your eyes squint. 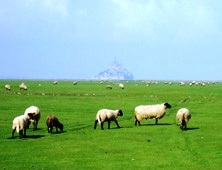 Mont St Michel is amongst the most unlikely, extraordinary sites on the surface of the earth. What makes it so exceptional, besides bearing some of the finest examples of gothic architecture ever produced, is the location of the "Mount" itself. 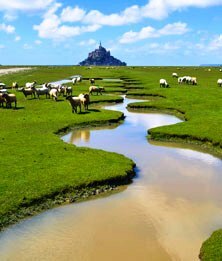 The so-called Bay of Mont St Michel sees the largest tides in the world with up to 12 metres difference between high and low! As a result, the bay changes twice a day from a flat sandy beach to the ocean. We walk barefoot across the flat sand banks towards the "Mount" which we spend time visiting at the end of our walk. The Channel Islands, mainly Jersey, Guernsey and Sark are within a short ferry ride from St Malo and a very inviting destination for our free day. Landing on the island, one is immediately overwhelmed by the strong insular identity. The Channel Islands are a part of England just off the coast of Normandy. Somehow it can be said that they feel even more British than the UK itself. Blessed by a particularly mild climate, they are host to numerous vegetable farms and lush gardens. 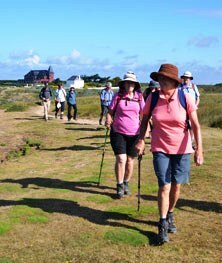 Brittany offers an outstanding setting for some wonderful walking; a rugged coastline swept by the rough Atlantic Ocean. Above the cliffs, massive granite headlands covered in heath extend back to sun-drenched forests and picturesque villages. The spectacular coast occasionally interrupted by long sandy beaches, rivers and hidden bays, surprises walkers time and time again. The movement of the huge tides provides a fascinating spectacle. Belle-Ile-en-Mer is surrounded by steep rugged rocks and braves the Atlantic Ocean. Incessantly wave after wave breaks at the innumerable corners and angles of the rocks, washing them continuously. Roaring surf and foaming spray are special features of Belle Ile. Our family run 4 star hotel in Cornwall is set in 65 acres of outstanding natural beauty, right on the banks of the Helford River. It has its own golf course, tennis courts, large indoor pool health spa and award-winning restaurant. Our hotel in Dartmoor has been a former mill and is nestled in a river valley just outside the ancient moorland stannary town of Chagford. It is well known for its excellent cuisine. In St Malo we stay right at the entrance to the historical fortress town and only a short distance to the Mt St Michel Bay. Our chef specializes in a traditional, yet creative cuisine made with regional produce, fish and seafood. Our hotel on the quaint island Belle-Ile-en-Mer boasts an unbeatable location, right on the characteristic steep cliffs overlooking the Atlantic Ocean and the Aiguilles de Port-Coton landscapes. Departure dates have been arranged to allow both the "On the Celtic Way" and "Discover the Pyrenees" walks to be combined. I'm very glad I took the chance to travel with a friend and do a trip a bit out of my usual comfort zone. I was one of the few 'non-repeaters' in the group of 14 - and the oldest - but it was a great group, and Gilles and Pascal looked after everyone beautifully. The accommodation was excellent; varied in character and location and never bland-international-hotel style. The food in our Cornwall hotels was tops; superior to the cuisine in Brittany (but, as the French friends we stayed with after the tour pointed out, Brittany has never been one of the gastronomic high spots of France, so no surprises there. And they're very good at galettes!). The coastal walks in both countries were magnificent, with the moors and the standing stones as counterpoints. We were lucky with the weather, too - only one wet day, really - and escaped the heat wave that's currently tormenting Europe. Salut to Gilles and Pascal - they did a wonderful job." We really enjoyed this walking holiday excellent accommodation and food. The walks were varied and interesting. 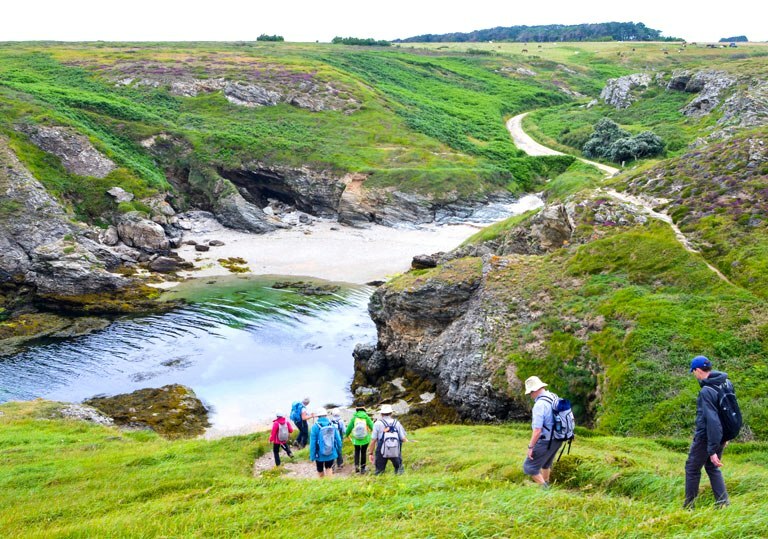 Belle Ile was a wonderful surprise with terrific coastal walks no crowds of tourists and magnificent weather. Thank you to Gilles and Pascal for your excellent leadership of the trip." The accommodation and food in Devon and Cornwall was superb and the walks not at all hard. It was very scenic and the weather was very kind to us. Brittany was a little hotter and the walks a little harder but the scenery spectacular." Wonderful selection of locations. Accommodation excellent. But what really made the tour was the competence and concern of both of the guides Gilles and Pascal." Our second WGA and what an enjoyable trip!! The ever-changing, rugged scenery on this coastal walking holiday ensured each day was different and challenging. Our fellow walkers were fabulous company. Outstanding accommodation and comfortable hotel rooms, all with a view. The Citadelle Vauban on Belle Ile was our favourite for its uniqueness, atmosphere, exceptional architecture and beautiful grounds. Gilles and Dominique were a great team - thank you for sharing your knowledge, humour and enthusiasm to ensure we all had such a fabulous holiday." Our 3rd trip with WGA maintained the high standards we have now come to expect. A combination of excellent leadership provided by Gilles, well coordinated planning, wonderful coastal scenery, lovely accommodations and delicious food ensured another most enjoyable trip. We can only agree with the positive comments made by our fellow travelers in the previous 3 comments, which say it all! Looking forward to booking another trip next year." 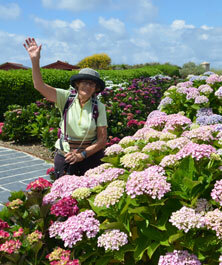 We have undertaken many walking holidays in different parts of the world. On The Celtic Way appealed to us on numerous fronts. Firstly the regions of Cornwall, Devon and Brittany were very appealing. Secondly, the combination of interesting hotels and good food is what we enjoy after a day's hiking. And thirdly, Gourmet Walkabout has such a strong customer base of repeat clients that we were always confident that our experience would be equally good. We were in no way disappointed! Our guide, Gilles, was outstanding. He has a knack of understanding a diverse group of Australians and addressing their individual needs. He is enthusiastic, humorous, caring and adaptive. On several occasions he anticipated circumstances that called for adjustments to the itinerary. He was flexible enough to make changes that were totally appropriate and added to our enjoyment. The itinerary is not demanding for regular walkers. But it is well planned and incorporates a range of terrains, scenery and experiences. We even got to invite some friends to join us for a game of golf at a delightful resort in Cornwall. Our group was very harmonious and enjoyed sharing the experience. We put this down to the structure of the tour, Gille's leadership, and the success of WGA in attracting like minded people. We would certainly recommend WGA to our friends (just as they recommended it to us." My first Gourmet Walkabout Adventure journey and how delighted I am that I worked up the courage to take this adventure. I thought that I was reasonably fit but by the end of the first day I wondered what I had let myself in for. Gilles and Dominique were fantastic and very encouraging, there to give a helping hand over a high style or down a very difficult path on a cliff slope. Would I like a photo taken I this fantastic spot etc. Each day got better and the sense of achievement grew and to be told at the end of the journey how well I had done was great. The accommodation was excellent and to stay in a Citadel was amazing. The food was delicious. A lovely group of fellow travelers. My family are so proud of me for undertaking such an adventure and I like to think that I will go again one day." I chose this walk for the ease. Absolutely true, I did not use Voltaren once. That does not mean that were not undulations, dramatic ups and downs but for some reason totally manageable. This tour was a fabulous surprise. The scenery was beautiful - rugged, stunning and variable. Each hotel was memorable in its own idiosyncratic way, both the rooms and the food. Every room had a lovely view. As a single I was not stuck somewhere out the back. I had never been to Cornwall before and was expecting scenery as seen in the TV show, Doc Martin. This did not really eventuate but what I saw was dramatic in a gentle way. Even walking past sedate, grazing, free-range beautiful looking cows on top of a cliff top as we walked down to a low tide beach was a unique experience. While I had seen some of the country on the French section, it was good to revisit and see it in an un-hassled manner. There is nothing like walking and taking your time in the countryside. However, for me, the outstanding section was BeIle En Mer. This was again, truly, a unique experience. The colour and the drama of the coastline was magnificent, especially the blue-green sea. The tour was very lucky to stay in The Citadel, the fortress of the island. The accommodation, the gardens, the ambience and the food were all outstanding. I know that I will return to this island again as it is glorious. Everything about this trip seems to run smoothly under the caring eye of Gilles, the tour leader. I could not fault it and did not want it to end. So, to all the people on the tour, I cannot thank you enough for making this a memorable trip. Your companionship as well as the tour itself has been one of the best experiences I have had while I have been roaming around." We had a very cohesive small group very ably led by Gilles Boivin, as usual. The tour was a little less challenging than those we have done in the past and that suited our 80 year old legs. The walks were all very enjoyable and interesting and the accommodation selection and dining were first class. Hopefully, we can do another interesting walk that is a little less demanding and we think they are available. Thanks again to Walkabout Gourmet Adventures." I LOVED this walking tour! This is my 9th walking tour with WGA and, whilst I can never decide which I liked the best, this one would have been "up there". I am 10 years older than the year I did my first tour with WGA which means that I have just (actually yesterday) joined the Septugenarian club (if there is such a thing)! Cornwall and Devon are far more fascinating than one at first imagines. Gilles, our guide, made them even more so with his attention to detail. The tour is well thought out, taking us to very interesting and exciting places. We had Brexit thrown in for good measure - very interesting times. In France we visited Mont St Michel, walking in from a different direction to most tourists. Belle Ile in Brittany is a magical island with so many surprising nooks and crannies. Our hotels, both accommodation and service were all top class and the food always topical and delicious. We had a very cohesive and happy group of 8 walkers, whom Gilles ensured were all happy and satisfied. Great value for money, too! Thanks Gabriella and Graham and a very special thanks to Gilles. See you again soon. With very best wishes." Our first WGA tour was a wonderful experience - the walks were a good mix of cliff tops, sandy beaches, country lanes, quaint villages, moors, and beautiful gardens, at the right pace to enjoy the scenery, but strenuous enough to build up an appetite for the gourmet dinners each night. Finishing with four days on Belle Ile was perfect. Thanks to Gilles and Gabriela for their care and friendship." This was an excellent tour, ably led by the inimitable Gilles and Gabriella. We stayed in excellent hotels of great charm, especially Budock Vean at Helford in Cornwall. We had excellent regional cuisine, and even some good beer. The walks in Cornwall and Devon were very picturesque with the "Lizard" walk the probable highlight. Then over to Britanny, the walled delights of St Malo and the splendid spectacle of Mont St Michel. Then the final delight of the aptly named Belle Ile en Mer. We had three spectacular coastal walks, with endless vistas of the sea and cliffs, punctuated by gorgeous seaside villages, including Sauzon with its colorful harbour, boats and houses and where it seemed many Citroen CVs had gone to retire. We channeled our inner Monet at les Aiguilles du Coton. Those braver than I swam in the Atlantic and walked around the observation deck of the Grand Phare, 40m above the island. Thanks Gabriella and Gilles for a memorable two weeks." This was my first Walkabout tour which I shared with a great group of fellow walkers. I loved every minute of it. The walks along the rugged coastlines of England and France were absolutely beautiful as was walking across the moors and through the English countryside, listening to babbling brooks and admiring the summer flowers. In France St Malo was beautiful and I won't forget my swim at the beach at Belle Ile. The walking was not difficult and it was great to come home each evening to be treated to fabulous meals. We were so well looked after by Gilles and Gabriela. Thank you both for your great company and care. I'm looking forward to my next Walkabout adventure." We had visited relatives in southern England prior to the trip starting. The hotel in Exeter was great as we had been told it was not much but as we found out the hotel had been changed. Buddock Veine our first stop was one of the nicest hotels to stay in. The fact that they had a dress code for dining was very nice and the food and service matched the dress code. The walks were very pretty especially the Cornish coast and lunch at lizard where we tried pastys and fudge. Mill End at Chagford was very nice and the general store at Chagford was something to see. A pleasant walk up to the castle before we went to the ferry for our overnight crossing to France. St Malo was nice but the lunch at the oyster farm was special. The cathedral trip was something else walking back to the bus in the wind and rain. The highlight would have to be Belle Ille with lovely walks ,swims in the Atlantic and a lovely hotel. This was a place mostly not heard of by tourists. And to get back to Paris for the start of the sales. In Paris we did a short River and canal trip which is worth while if you have not done it. Gabriella and Gilles were at there usual best. Liz and myself would have no hesitatation recomending this trip." Chris and I want to thank you for the experience of a life time. What a wonderful time we had with you and the group exploring Slovenia and Croatia. Memories of those mountain top experiences, picnicing while viewing vast valleys and the Alps in the distance will be with us forever. We are now of course hooked! and were wondering if there are any places available On the Celtic Way for next year, 2015. Until we journey together again." Like all good holidays this had a mix of old and new. Old - the familiar and well organised gourmet walkabout process where the details are well taken care of and knowing that you will have lots in common with the group - all based on a love of walking and the outdoors. New - some really new stunning landscapes. I really joined the tour because of the Mont St Michel visit - a once in a lifetime trip. Belle Ille was wonderful, I have been telling all my friends about it. Lovely walks, very relaxing place, good food. I also loved St Malo - a great place for a short break. I thought the walking was a good mix - started easy and got a bit harder thru the trip as people got fitter. On the whole not difficult walking." Great journey. Buddock Vean and Mill End were both marvellous places to stay. We had great luck with the weather. The walks on the Lizard Peninsula and on Dartmoor were a delight. Saint Malo is a wonderful old town with intact city walls. It is a true maritime trading town having originally been built on an island. Mont St Michel is as stunning as I had imagined but sadly no religious seem to use it any more. It makes it that bit less special. Sign of our secular times I guess. The highlight had to be Belle Isle. Stunning scenery which seems better around each corner. The accommodation was good but I could not get over how like the Adams Family house it looked, in its solitary position on the cliff top. The creperie close by was a delight. Finally, I should have said how wonderful it was to have kippers each morning at Buddock Vean. Breakfast of the Gods in my view." Really, really enjoyable. Having the 2 countries made it very special, the connecting ferry worked very successfully. The highlights for me were the beginning and ending stays. 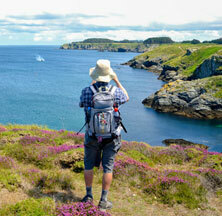 Both Helford Passage and Belle Ile combined wonderful accommodation and food with excellent walking. The superb weather was an added bonus, helping to show off the masses of wild flowers and the vivid green of Southern England. 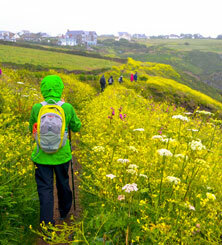 Belle Ile's cliff top walks, and lack of tourists was delightful. And Gabriella and Giles were excellent guides. I wouldn't change anything." As usual the tour was very well organised and I thoroughly enjoyed it. The walks were good and not demanding, but a little too much of the same scenery, both in the Uk and France, how that could be changed I'm unsure, maybe do another part of France rather than Brittany. This sounds rather picky because I did enjoy the walk. Both Gabriella and Giles were fantastic a good combination. Hope to do another in the not too distant future. Helen Clugston." This was a true holiday as I was able to relax completely, and felt the benefit of this for weeks afterwards. The first thing I noticed was that several of our group had been on these tours before, some multiple times. It soon became apparent why people came back for more. The environments chosen for walking were what I hoped for - the drama of spectacular coastal trails, the lovely moorland rambles, or the deep shelter of green English lanes - all were delightful in their own way. Accommodation was very satisfactory, comfortable, attractive, and on Belle Isle superb location. I liked the pacing of the program - not too much moving from place to place but certainly enough variety for all the stays to be interesting. As well, the pace of the walks was always comfortable, so that one was never over- stretched yet pleasantly tired at the end of the day and ready to settle down for drinks and dinner. My only responsibility was to keep some sort of track of the eating and drinking, but that took care of itself. It seems the indulgent breakfasts and excellent dinners with their wine accompaniments - every day! - must have been offset by all the fresh air and exercise, because there were no repercussions at all. I would like to walk again with you." A most memorable 14 days of fine dining and superb coastal and inland walking evoking many changes of scenery and moods. The abundant wild flowers around Cape Lizard were a delightful surprise. The fish meals at Budock Vean were exceptional; the galettes and crepes in France so moreish! Our leaders Gabriela and Gilles were so helpful and friendly and our group, starting out as strangers, soon became more like a family. We had lots of laughs and carry home with us a wealth of special memories. The whole experience more than met our expectations. Thank you Walkabout Gourmet."